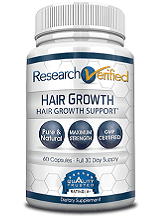 This is a review of Research Verified Hair Growth. The company which is manufacturing this product claims it provides the much needed nutrients to the scalp, nourishing the hair follicle and the hair strand itself. It treats the underlying issue being hair loss, at the same time promoting the growth of new, healthy hair. Vitamin A promotes a healthy scalp, vitamin B2 provides nutrition for the follicles, B6 is used to prevent dandruff, and B12 is needed by the body for a number of different metabolic functions and vitamin E acts as an antioxidant and moisturizes the hair. Iron is necessary for hair production, copper contributes to growth of new hair, zinc strengthens the individual hair strands, and selenium show strong antioxidant properties. Deficiency in iodine is linked to a condition called hypothyroidism, where the hair produced is not as healthy as it should be, leading to breakage, splitting and eventually hair loss. L-Cysteine is needed for production of keratin, a protein chain found in the hair, skin and nails, while L-Methionine adds strength to the hair. Silica helps hair and skin retain moisture and prevents them from becoming dry. Other ingredients include a gelatin capsule, micro-crystalline cellulose, magnesium stearate and silicon dioxide. The recommended daily intake for this supplement is two capsules before meals, one in the morning and one in the evening, with one cup of water. Buying one bottle of Hair Growth will cost you $48, for three bottles you will pay $98 and the price for six bottles is $142. The manufacturer of this product has not specified when you should be expecting seeing the first results or how long you should keep using it. Individuals with an underlying issue, those under the age of 18 and pregnant and nursing mothers should consult with their doctor before using supplements, including this one. Not all supplements work exactly the same on every person and if you are in any way dissatisfied with the product, you may return in within 60 days for a full refund. You must return all the bottles, even the used ones or you risk getting a partial refund. Unfortunately, there were no reviews or testimonials on the product website, which may raise a concern to some individuals. A great number of factors contributes to hair loss, including heredity, hormonal imbalance, certain medical condition, stress and lack of certain minerals, vitamins and proteins in your everyday diet. This product is aimed not only to treat the dietary deficiencies you might be experiencing, but also the underlying condition behind the hair loss. The ingredients were carefully chosen and the price is quite affordable.